Grayson loves our Christmas tree -- as soon as he saw it the first time after we put it up, he wriggled his way underneath it and layed there for a 1/2 hour just staring up through the branches. He turns the lights on every morning as soon as he gets downstairs. He also has fun rearranging the ornaments he can reach. On Christmas Eve, we went over to Steve's parents' house for dinner and presents. My boys looked so cute in their jackets -- too bad Gray didn't want to cooperate for the photo-op. Gram and Grandpa gave Gray a motorized Thomas train and track! He loves Thomas, so he was/is super excited about it! He also got his very own car! He calls it "sheriff" because it's black like Sheriff on Cars. He couldn't even wait til daddy was done assembling it to climb in. That is one happy boy! Here he is dancing -- he 'dances' with his hands mostly -- doing a happy dance. Stealing some of Grandpa's milk. Coming down the stairs at home on Christmas morning. He was so surprised to see all the new toys on the table! Gray loved the bucket of dinosaurs he got. Here he is feeding the "big dinosaur" some trees. Guess it's a herbivore. Giving his new "dragon" a big hug! Trying out his new tools with Daddy. Daddy gave Gray a model of an orange Mustang -- starting the boy young with the love of cars! Rowan and Grayson both got these music kits from Nana and Poppa -- but preferred to collaberate together on their jams. Gray was a little confused as to what was his and what was Row's. He thought everything was HIS. We got it all sorted out in the end, though. 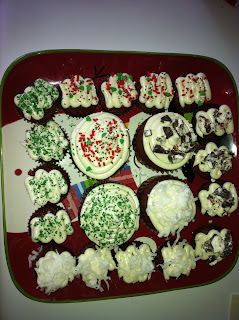 I made most every gift I gave this year, and JD's was the best. A boobie pillow to snuggle. I won't post the full-frontal pic, in case we have some sensitive readers here. But it's hilarious. Kenna's face says it all. Grayson got a little overwhelmed by everything and disappeared into the next room for a while. 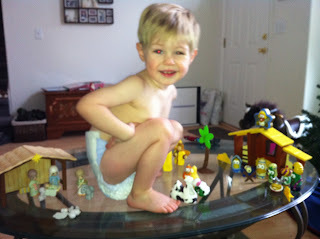 When he came back, he wasn't wearing any pants. I guess that made it all better, and he was ready to open more presents. Of all the awesome presents he got there, his very favorite things are little figurines of a lion, tiger, and bear that my mom gave him. It's so funny how the littlest things can make kids so happy! Gray loved helping me make treats this year -- because he got to lick the frosting off the beater. 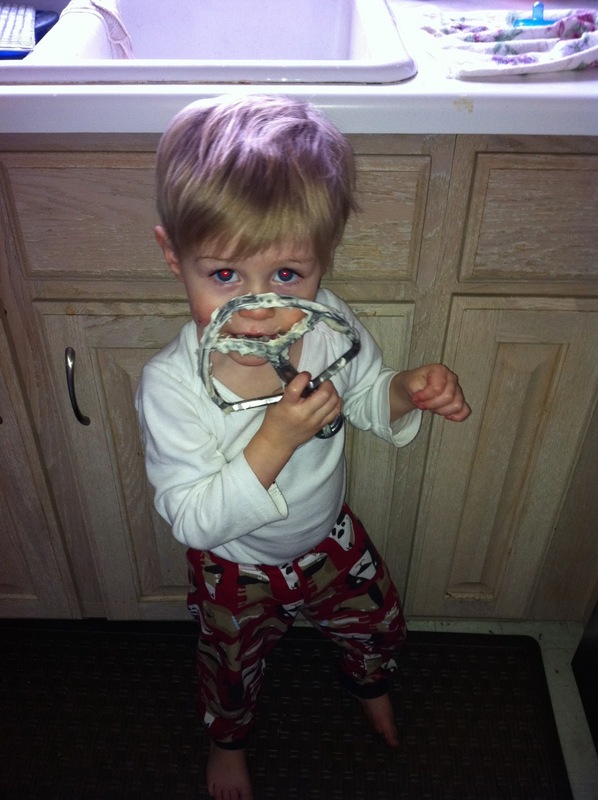 He's doing his happy dance here while licking the beater. 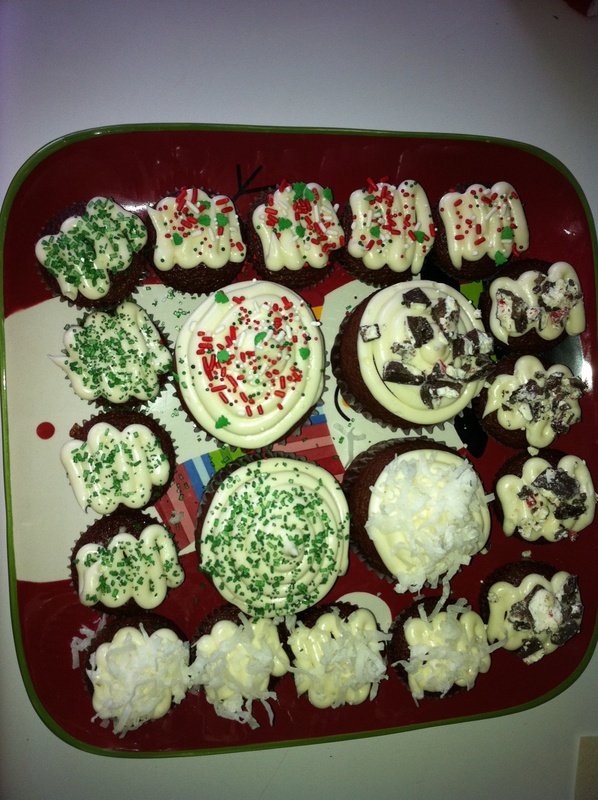 Here are the yummy cupcakes I made. So festive. 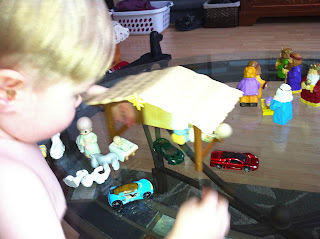 Random pic, but I think it's funny -- you didn't know there were sports cars at the Nativity, did you?! Or a giant, clothes-free toddler stomping around outside the stable? Here is the absolute best Christmas gift! My wonderful in-laws gave us a new fridge!!! It's awesome! Christmas night we went over to Grandma Oka's house -- and I didn't get any pictures there. :P But we got spoiled yet again there! Gray got a Dumbo stuffed animal from Aunt Mitsie that he carries around the house and has to sleep with, and an Elefun game from the Larson kids that he has to play with at least 3 times a day. Thank you to all our wonderful family and friends for making it such a wonderful Christmas!! Looks like you guys had a great Christmas. Love the boobie pillow and it totally lookes like he is molesting it in that picture. :) Does it look like that thing that Sue use in staff meeting to demonstrate how we were supposed to help our patients breastfeed?? Glad you had an awesome Christmas with your family. Good luck with the new little one coming soon. I have that Veggie Tales Nativity scene!! ah yes - the boobie pillow has to take the prize for the best gift selection !!! Looks like you guys had a very fun Christmas!! I enjoyed looking at all your cute pictures. Sounds like Gray had a similar reaction to all the gifts as Rockwell. He was very overwhelmed by all the presents.